Antioch and Molly Canter for the First Time! Molly cantered him for the first time tonight and he was fabulous! He learns everything so fast. 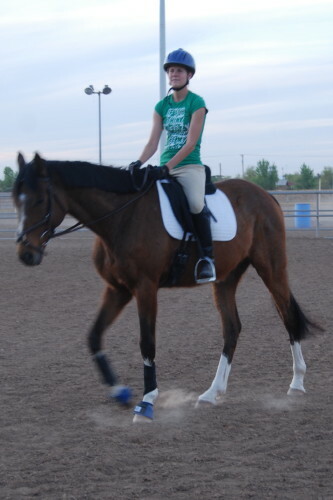 He now longes with voice commands and goes at the walk and trot over poles and now she can work on his canter leads! We just love him. I hope all is well at Bits & Bytes Farm. We are very proud of Molly and Antioch. They are learning together with the help of a competent trainer and a supportive mom. Molly is in Pony Club and she is learning all kinds of new riding and training skills while working with this wonderful off-the-track Thoroughbred.